Magnet Printing - Print Custom Magnets Online at PrintFirm.com! Magnet Printing - PrintFirm.com provides custom magnet printing services online. It's FAST and EASY. Order today and SAVE! With the advances in printing equipment and materials over the years, the variety of materials that are suitable for printing has grown, and the cost for printing on non-paper materials has dropped. Magnet printing at PrintFirm gives you quality results at a reasonable price. 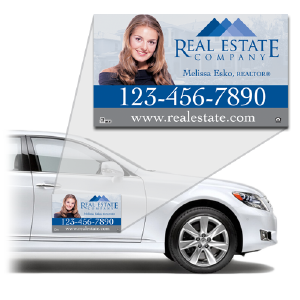 We offer magnet business cards for your networking efforts and car door magnets for your automobile advertising needs. 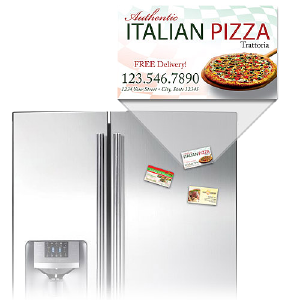 Magnet business cards can be stuck to metal objects such as refrigerators and filing cabinets. Car door magnets can be placed on the door of any automobile that has enough metal for the magnet to cling securely. Our magnet business cards are the standard card size of 3.5” X 2”. 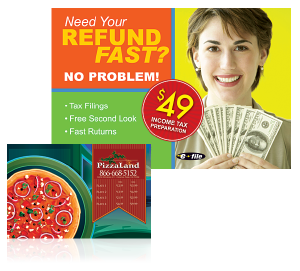 They are printed in full color on a durable 30-millimeter magnet surface. A glossy UV finish covers that surface that is resistant to dirt and moisture. If you want a non-standard look, we can round the corners of the magnet business cards during magnet printing. Rounded corner radiuses include 1/8 inch and 1/4 inch. Two car door magnet sizes are available: 12” X 18” and 12” X 24”. PrintFirm’s car door magnets are printed on a 30-millimeter magnet surface with a UV coating. A rounded corner option is available. You can upload your own print-ready design to our website before we commence with magnet printing. We accept popular file formats such as PDF, AI, JPEG, TIFF, etc. If you don’t have anyone with graphic design skill in your organization, you can ask PrintFirm’s team of talented graphic artists to create a design. For any uploaded images, we recommend that you use a minimum resolution of 300 DPI (dots per inch). Lower resolutions may look fine on your computer screen, but once they are printed out, the result is typically a blurry mess. Please use caution when using images found on the internet because they are generally low resolution. To check the DPI of a file, open it in your favorite graphic design program and note the file details. Avoid crowding the design with too much text or graphics. The magnet printing result will appear unprofessional. There should be enough whitespace (area without design) for a pleasant viewing experience. Do not make the font too small so that reading is difficult. This is especially true for car door magnets, which may only be viewable for a few seconds by vehicle passengers at relatively far distances. Just like in other offset printing processes, magnet printing requires enough bleed space. To compensate for the margin of error during the cutting process, please extend your design about 1/8 of an inch past the design borders. This will ensure that you have quality, consistent results through each magnet printing run. Proofread your design. A small text mistake in a magnet business card or car door magnet design can wreck a promising advertising campaign. Ideally, multiple people should proofread the text, and it’s a good idea for at least one of those people to be a skilled editor. If you don’t feel comfortable editing the text, you can hire a professional.